Hit with a blast of lemon-pepper marinade, char-grilled. Entrees include: Corn Bread Muffin, Corn-on-the-Cob, and Choice of two side dishes. Add a Cup of Chicken Wild Rice Soup, Chili, Garden Fresh Salad or Caesar Salad for only $2.99. Wet your appetitie for barbeque with two of Hayard's most popular smoked meats, served together on a generous sampler platter. Spicy hot wings served with Blue Cheese dressing. A favorite that will definitely please your taste buds! Breaded mushrooms, fried golden and served with our tangy horseradish sauce. Topped with shredded Cheddar, Cucumbers, Tomatoes, Onions and our savory Smokehouse Bacon. With our own dressing, shredded Parmesan and croutons. A bowl of soup served with choice of a House or Ceaser Salad. Kansas City barbecue refers to the specific inner city style of barbecue that evolved from the pit of Henry Perry in the early 1900s in Kansas City, Missouri. 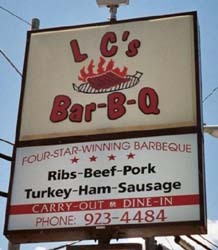 The Kansas City Metropolitan Area is renowned for barbecue. 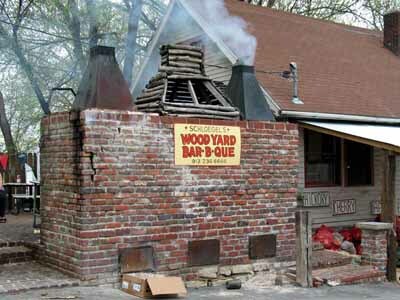 Kansas City, Missouri has more than 100 barbecue restaurants and proclaims itself to be the "world's barbecue capital." There are large, well attended barbecue cooking contests, the two most notable being in Lenexa, Kansas and at the American Royal. In 1977 Rich Davis began the efforts to nationally market a more suburban version of barbecue sauce called KC Masterpiece (which is now owned by a division of Clorox). Efforts by Bryant's and Gates to export Kansas City barbecue beyond the metro area have not been commercially successful, although the two do market their sauces to travelers at Kansas City International Airport. Jack Stack Barbecue has been shipping their barbecue nationwide since 2000, and also offer their sauces and fully cooked pork rib packages at the airport. Kansas City traces its barbecue history to Henry Perry who operated out of a trolley barn at 19th and Highland in the legendary African-American neighborhood around 18th and Vine. 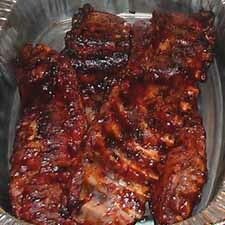 Perry served slow-cooked ribs on pages of newsprint for 25 cents a slab. Perry came from Shelby County, Tennessee near Memphis, Tennessee and began serving barbecue in 1908. The style of Kansas City and Memphis barbecue are very similar although Kansas City tends to emphasize using as much sauce as possible. Perry's sauce had a harsh peppery flavor. Perry's restaurant became a major cultural point during the heyday of Kansas City Jazz during the anything goes days of Tom Pendergast in the 1920s and 1930s. Working for him was Charlie Bryant, who in turn brought his brother Arthur Bryant into the business. Charlie took over the Perry restaurant in 1940 on Perry's death. 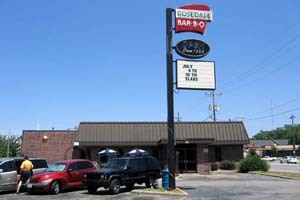 Arthur then took over his brother's business in 1946 and the restaurant was renamed Arthur Bryant's. In the process he sweetened Perry's sauce with molasses "so that you could eat it on bread." Bryant who eventually moved to 1727 Brooklyn in the same neighborhood became a stopping ground for baseball fans and players in the 1950s and 1960s because of its close proximity to Municipal Stadium. 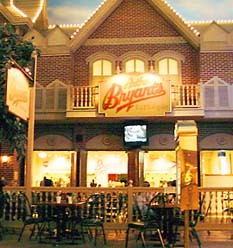 In 1974 Kansas City native Calvin Trillin wrote an article in New Yorker Magazine proclaiming Bryant's to be the best restaurant on the planet. Despite new found fame, Bryant did not change its very simple decor with fluorescent lighting and formica tables and 5-gallon jars of sauce in the windows even as Presidents Harry Truman, Jimmy Carter and Ronald Reagan stopped by. Bryant died of a heart attack in a bed that he kept at the restaurant just after Christmas in 1982. The restaurant is still open. 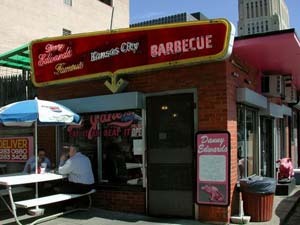 In 1977, Rich Davis capitalized on the inner city reputation of Kansas City barbecue to form KC Masterpiece which evolved from his K.C. Soul Style Barbecue Sauce. KC Masterpiece was sold to the Kingsford division of Clorox in 1986 and now claims to be the number one premium barbecue brand in the country. The KC Masterpiece brand is actually sweeter than the classic Bryants and Gates sauce. Davis has held KC Masterpiece barbecues on the White House lawn for George H.W. Bush and George W. Bush. 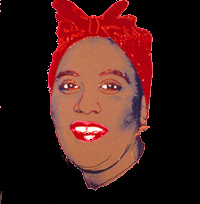 When Davis sold the rights to his sauce to Clorox, he announced plans to build a franchise of barbecue restaurants. However the plans have not worked out and the only remaining KC Masterpiece restaurant is in Overland Park, Kansas. 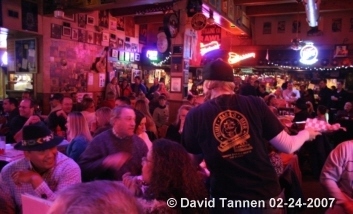 The Kansas City Barbeque Society (KCBS), with over 6,000 members world-wide, is the world’s largest organization of barbecue and grilling enthusiasts. 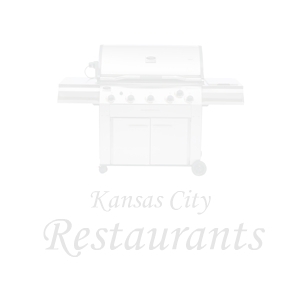 KCBS is a nonprofit organization dedicated to "promoting barbeque and having fun while doing so." KCBS sanctions more than two hundred barbecue contests across the U.S. each year and offers assistance to civic and charitable organizations with producing these events. 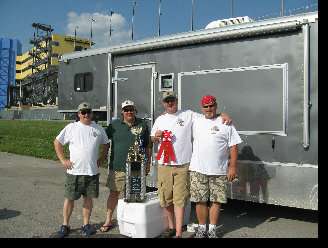 The KCBS has developed a set of rules and regulations that govern all official KCBS competitions. KCBS offers educational programs, consultation services, and civic organization presentations to help spread the gospel of barbecue. The mission of the Kansas City Barbeque Society is to celebrate, teach, preserve, and promote barbecue as a culinary technique, sport and art form.